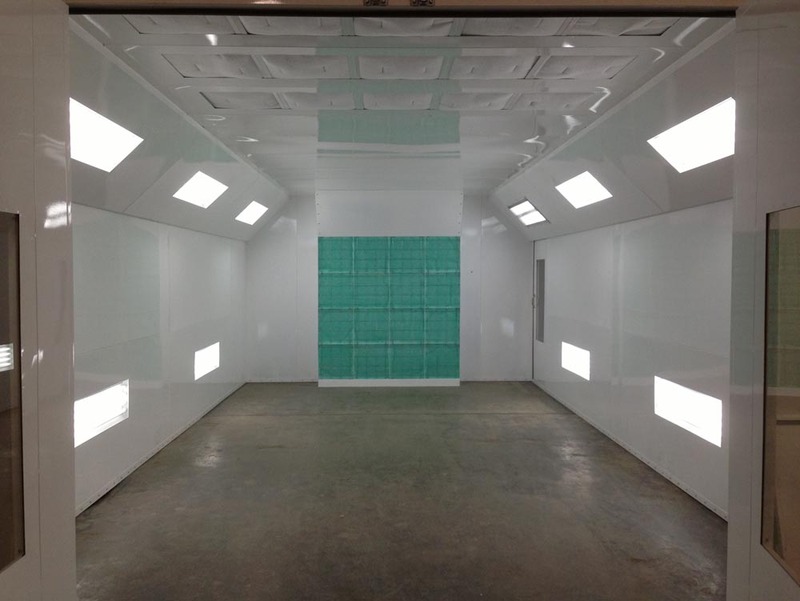 Paint booth airflow and filtration are integral to your shop’s overall productivity, yet these aspects are often neglected. If your spray booth can’t breathe how can you expect it to perform? Dirty intake filters or filters that are not the correct size and type slow down the incoming air to your paint booth, and a whole mess of problems result. Negative pressure will result in dirt being pulled into the booth from any unsealed opening or worn out doors and seals. This dirt will more than likely end up in your finished product, so you will have to buff after the paint is dried. This takes up valuable time that could be spent painting another job. And as we all know no one gets paid to wet sand and buff. When you have dirty filters, your motors have to work harder, which means they run hotter than they normally would with clean filters. This will not only shorten the belt life but also the motor life. Once your motor or belt is damaged, the cost to replace or maintain the parts depends on the type of booth you have. Avoid this headache all together by regularly checking and replacing filters. It’s a great idea to keep extra filters on hand so you don’t have to place orders each time you find an overloaded filter. Your paint jobs will suffer if your airflow FMP drops or does not remain consistent due to a dirty filter. When you do not maintain proper airflow, you can have lingering overspray, dry sealer, paint or clear coat residue in the booth. This is not only unhealthy for the operator but a potential problem for the paint material. Especially with today’s paints and clears, air not only has to be dry, but free of lingering particles if you want optimum results. Technically, a painter doesn’t get paid to change a filter—but he doesn’t get paid to buff or sand an imperfect paint job either. Make it clear to your painters that it is in their best interest to maintain the filters so they can work in a cleaner, safer environment that produces better results. Reworking a paint job is not beneficial to anyone, and by simply keeping a stock of spare filters, your painters can quickly and conveniently change out overloaded filters and avoid the waste of time and energy. • A good exhaust media, such as Paint Pockets, can last a few months even in a busy shop. • On a direct-fired heated booth, the filters will last up to 1,000 hours, which is an average of 6 months. • If you have an indirect-fired booth such as a Nova Verta, you can expect 2,000 hours of diffusion media life. • If you are still using fiberglass exhaust media like many facilities, we suggest that you use yellow and white 22-gram media that has the ability to hold more dry paint than a cheaper 15- or 18-gram media—it’s just a few dollars more.